Wallpaper has been making a steady return to interior design for the past several years, but this year patterned wallpaper will be a major trend on ceilings and accent walls. There are wallpapers available that peel off easily when you don't want it anymore, which may be ideal for dorm or apartment living. But as always, be sure to check with your residence department or landlord before sticking. 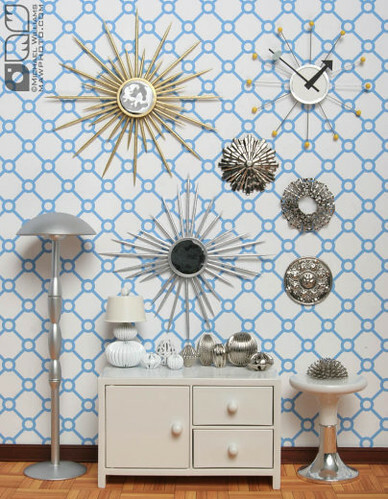 Consider hanging a wallpaper scrap as a pop of color and pattern in your room. Sustainable materials like cork, bamboo, and organic fabrics are in. Use these in your space whenever possible. And don't cover up your cork board with fabric, paper, or paint this year. Natural cork will make for an utterly stylish and sustainable inspiration board. Like shiny things? You're in luck. Sparkly and metallic surfaces will be trendy this year. Incorporate silvery sheen with brushed steel, chrome, and mercury glass accessories. Gray is the go-to neutral this year. 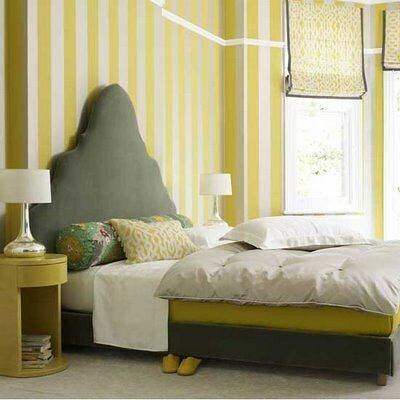 And when paired with unexpected colors like bold yellow, lime green, and jewel tones... it is anything but bland! Where you would normally choose brown, beige, black or white, opt for gray instead. (On bedding and major furniture pieces like chairs and sofas.) Then spike the gray with accessories in a bright color to keep the cheer in and the drear out. We're not talking your grandma's ruffles. Ruffles this year will be soft, frothy, and billowy. Urban Outfitters offers some lovely ruffled bedding, drapes, and shower-curtains right now. i love the corkboard because I always have a ton of photos and little notes! I'm into the corkboard too. It's just so pretty! Hmmm...where would I find a corkboard I could use for an inspiration board? I've no idea where to start. Jill---I always have lots of little notes, too. Corkboard is a lifesaver. Aury---I'm not sure what kind of stores are in your area... but squares of corkboard can be bought at craft stores and even places like Walmart and Target.